For the couple who has everything, His and Hers embroidered face flannels in cream or white. For the couple who has everything, His and Hers embroidered face flannels in cream or white. Great wedding or anniversary gift idea. These face cloths are is 100 percent soft cotton 500gsm. A pair of face cloths available in your choice of cream or white fabric. Personalise this His and Hers set in a thread colour of your choice - perhaps to match the bathroom decor! 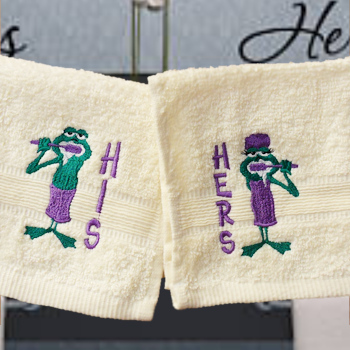 We will embroider the frog motifs and His and Hers titles in the thread colour you select.